A good assortment of Tenants can reap big rewards. Tenants are a type of NPC spawned by placing a Colony Deed in a suitable room. Tenants have a wide variety of appearances and roles, and can be a valuable source of income and rare items, as a satisfied Tenant will pay various types of rent to the player over time. Most (but not all) Tenants also offer a variety of generated Quests, which can lead to Tenants requesting to join the player's Crew aboard their Ship. There are also unique Quest types to Tenants, generally focused on building new homes for even more Tenants, which have a higher chance of offering rare and exclusive objects as prizes. While wandering around, Tenants will interact with each other and just about any object the player can interact with (furniture, wired items, gongs, music players, teleporters, trash bins, etc), and many things the player can't (sinks, hand dryers, arcade games, tombstones, etc). A good spread of interactive objects can keep them from bunching up. 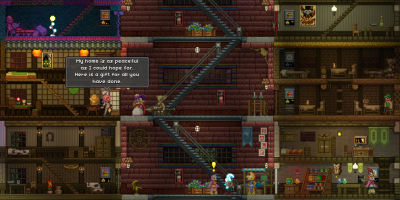 Tenants can be killed by hostile Monsters and NPCs, as well as environmental hazards. However, they will respawn back at the Colony Deed within a few seconds, good as new. The bare minimum for a viable Tenant "house". Colony Deeds cannot just be placed willy-nilly, and will not summon a Tenant unless a bare minimum set of requirements are met. The area must be a fully-enclosed space with floor, walls, ceiling and background wall. Walls, ceilings and floors can only have "holes" if they are filled with a Door of some type. Background walls must have no open-air gaps. On player ships, uncovered ship windows are acceptable background walls. Platforms do not count as floors or ceilings. There must be at least 1 Light and 1 Door. There can only be one Colony Deed per room. After those requirements are met, the Tenant type summoned depends on the Tags of the objects placed within the room. If a Tenant has multiple Tag requirements, both tags do not have to be present on the same object: you can have a "Combat"-tagged object and a separate "Titanium"-tagged object. "Themed" Tenants (see below) will always appear instead of "generics" if those conditions are met. If the room meets the conditions for more than one "themed" Tenant type, the Tenant will be chosen randomly between the potential options. If you are not getting the Tenant type you like, remove the Deed and try redecorating the room with only the bare requirements for that Tenant, then add more objects once they are summoned. Adding or removing any objects beyond the minimum requirements of a current Tenant will not affect their disposition. Over time, rent will become available (see "Rent Tables" below), indicated by a present on the Colony Deed screen. Interacting with the Deed summons the Tenant back to pay up. Unpaid rent can be lost if the Tenant is made unhappy or killed, resetting the rent timer. Removing the Colony Deed from the wall evicts the Tenant with no penalty (unless Rent is waiting to be collected, in which case it is lost). A Tenant will also move out in a huff if conditions change to drop below their minimum living conditions and the problem is not solved shortly. Removing the Deed from a Tenant's room when they have offered to join the player as Crew will not evict the Tenant; the only way to remove them then is to hire them on then dismiss them through the Ship's S.A.I.L. interface. NPCs created by Tenant-given "rescue" quests will stick around indefinitely, and may themselves offer Quests. However, they pay no rent on their own, and removing the Colony Deed of the Tenant who brought them in will not evict them. They can be killed by hostiles or environmental hazards, but unlike Tenants will not respawn. Tenants fall under three general categories: Villagers, Guards and Merchants. Villagers are very common Tenants who basically wander around and mess with stuff. When threatened by Monsters or enemy NPCs, they can do little more than run away. "Generic" Villagers as found in any NPC village are the lowest-priority type of Tenant, meaning if the requirements for any other Tenants are filled, those will spawn instead. There is also a large number of "themed" Tenants that can be summoned by filling their rooms with objects with specific Tags. Fleshy Collector Human Flesh (18) Anatomy Set Fleshy Collector 10~30 minutes ?? Friendly Cultist Human Evil (24) Cultist Set Villager 15~30 minutes ?? Grounded Avian Avianairship (18) Pirate Set Villager 15~30 minutes ?? Hazmat Scientist Apex / Human Odd (14), Science (14) Hazmat Set Villager 15~30 minutes ?? Philanthropist Random Valuable (76) Moneybags Set Villager 15~30 minutes ?? Sewer Worker Glitch Glitchsewer (24) Gas Mask, Craftsmen Shirt, Craftsmen Trousers Villager 15~30 minutes ?? Combat (12) Premier Set Villager 15~30 minutes ?? Traveller Human Traveller (1) Hiker Set Villager 15~30 minutes ?? Guards are armed Tenants who attack hostile monsters and NPCs. "Generic" Guard Tenants are summoned by placing crafted tiered furniture in their room. These Tenants are equipped with racial armor sets have increasingly powerful stats, but max out at Tier 4 equipment. There are also several "themed" Guard Tenants summoned with specific Tags. These Guards have a pre-set Tier, regardless of whatever other objects are placed in the room. Merchants offer a variety of goods, as well as buy items from the player. While Merchants can offer Quests, they will never offer to join the player's Crew. As with Villagers, they cannot defend themselves from hostile forces and will run away when attacked. 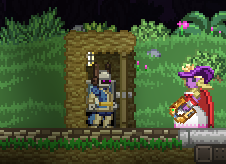 "Generic" Merchant Tenants sell a random assortment of procedurally generated Weapons, racial and generic Armor, decor objects, Seeds, and more, set to the Tier of the planet they inhabit. Chef Merchants sell a random selection of prepared Food items. Buying these does not add them to the player's Cooking Collection checklist. There are also a large number of themed Merchants who sell specialized sets of wares, determined by their room's object Tags. See their individual pages for their inventories. Once a Colony Deed indicates a Tenant's rent is ready, it remains there until the player interacts with the Deed, calling the Tenant back to pay up. The rent timer does not start again until it is collected, so "back rent" will not stack up. When the rent is paid in Pixels, the Tier of the planet the Tenant inhabits dictates the potential payouts, with more Pixels at higher Tiers. This page was last modified on 24 November 2018, at 05:32.